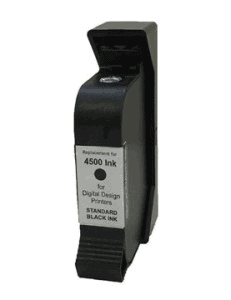 Keep your ink cartridges printing clearly! Many companies in Mail Addressing and Package Identification case coding leverage HP industrial inkjet technology to mark their products. The thermal inkjet systems, including Digital Design Evolution printers, Markem Imaje / RSI coders, Nutech, Triton, ANSER Coding, and many more are ideal for a number of different reasons, including ease of use & reliability. Nonetheless, at times the cartridges won’t prime, or nozzles will become clogged, leading to poor barcode print quality. In our services visits, we find that poor printing cartridges most often due to mis-handling, including poor storage, and then shaking the cartridge to try to get it working again! When production is done for the day, and the coding line is turned off for an extended period of time, a best practice is to place a plastic clip on the inkjet cartridge. This seals the nozzles so air doesn’t get trapped inside the cartridge. It also prevents the cartridge from drying out (aka de-prime). Shaking an ink cartridge to try to get the ink to “flow” actually just makes matters worse, creating air bubbles in the very small nozzle holes, effectively blocking the ink! 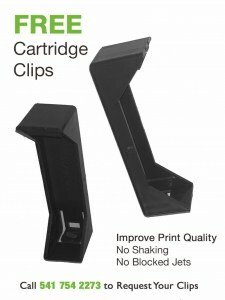 Plastic clips are available from Case Printing Solutions (Free of charge) with every cartridge purchase. The effort to install a clip cost justifies the very first time you save a cartridge from the recycle bin while there’s still ink inside. When you have a situation where the ink won’t jet out, avoid the temptation to shake it. So what DO you do when the ink stops jetting? Have a supply of DI (de-ionized) water and lint-free cloths nearby. Follow our instructions. For solvent inks, the DI water is not needed. CASE Printing Solutions is an expert when it comes to HP industrial inkjet systems. Whether you’re running a high-speed mail addressing system, or a 24/7 packaging line, CASE can help. Call or email us for assistance to: (1) troubleshoot your inkjet printer, (2) implement a bulk ink system, (3) buy & save when purchasing original and remanufactured HP ink products, (4) rebuild your print system and thereby extend its useful life, and (5) upgrade to a new print system. We help you get the most from your HP TIJ system and maximize Return on Investment. Contact us today: (541) 754-2273.